At Bayside Kids Dental, we understand coming to the dentist can be scary for a lot of first-timers—even for some of us more experienced “big kids” too—but these early years are formative in establishing healthy beliefs and habits they will carry with them for life. Not to mention, healthy baby teeth set the stage for healthy big kid teeth to come in later. That’s why we’re happy to offer calming sedation options so your little one can get the care they need, comfortably—no fear and no tears necessary—they might even look forward to coming back! Is Sedation Right for My Child? Schedule a consultation with us today to find out! The most common concern we hear when talking about sedation in dentistry is dental anxiety or fear of the dentist, which is quite common for kids. Maybe their first dental experiences were traumatic, or they’re just generally uncomfortable with the whole idea of sitting in the chair and having someone work in their mouth—we can’t blame them. That’s why sedation has been around since the beginning of… well, dentistry—to make the experience more comfortable and tolerable because it IS necessary! 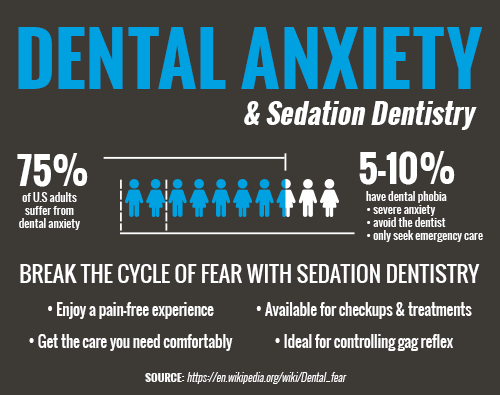 However, sedation can come in handy in many other circumstances aside from fear or anxiety. Maybe you have a child with high pain sensitivity or trouble getting numb with anesthesia. Maybe your child has a small mouth or a physical disability that makes it hard for them to receive dental care. Maybe they need extensive work done or just have trouble sitting still for lengthy appointments! Whatever the reason, rest assured our team is here to make them feel as relaxed and comfortable as possible and we have options for sedation to help take the edge off any visit. Does your little one suffer from… ? Nitrous oxide is the lightest form of sedation and is commonly referred to as “laughing gas.” Nitrous is inhaled through a small face mask at the start of the appointment to help your kiddo relax in the chair. They will quickly start to feel very calm and content as their fears and concerns melt away. They may feel slightly euphoric and might even get the giggles! They will remain more or less “awake” throughout the appointment, but the details will be fuzzy, and it will be over before they can say “aah.” The effects will wear off quickly after breathing oxygen for a few minutes at the end of the visit and you can both leave with a smile. Oral sedation is a more moderate level of sedation and is administered by taking an oral sedative about an hour before the appointment. Dr. Kenny Zamora can prescribe just the right sedative for your child’s needs. Once in the chair, they will drift into a waking dreamlike state where they will remain generally conscious and able to respond to the doctor, but the details of the appointment will be fuzzy, and they will be all done before they know it. It takes longer for the effects of oral sedation to wear off, so you should be prepared to drive your child home safely and stay with them until the effects wear off completely. Yes! Sedation has been used safely in combination with dentistry for centuries to help both kids and adults get the care they need in a more comfortable way. Dr. Kenny Zamora has received extensive advanced training to be able to provide safe sedation for kids, and we’ve helped many Odenton kiddos receive gentle, fear- and tear-free dental care. Many folks confuse general anesthesia with sedation, but you should know these are two very different things. General anesthesia is designed to block pain in the entire body, and putting the patient “all the way under” and requiring assisted breathing. Sedation is designed to induce that relaxed, waking dreamy state, and does produce some amnesic effects, but consciousness is maintained throughout. Sedation is a wonderful option for kids who may otherwise have a tough time receiving dental care and can even eliminate fears of the dentist! If you have any questions about sedation for kids or you’re ready to schedule a visit with your Odenton pediatric dentists, Drs. Kenny and Sarrah Zamora at Bayside Kids Dental, give us a call today or request an appointment easily online!